This weeks Mac setup is a bit different and that’s exactly what makes it so great. Kevin B. and his wife frequently travel with an RV and, naturally, their Apple gear goes with them. Their current destination? The Ponderosa Campground outside of Antonito, Colorado, where the steep canyon walls prevent any cell reception, yet the campground provides wi-fi. A riverside Mac setup with high speed internet? Sounds great to us! This setup ranks right up their with some of the other untraditional ones we’ve posted, like a MacBook on a motorcycle in the desert, a MacBook Pro on the rooftop in Goa India, can’t believe a MacBook is on a boat, and a tent setup in the midst of the Australian Outback. We’re officially envious Kevin, thanks a bunch for sending these in! What Happens When Two Mac Fans Get Married? It’s camping in an RV camper, different kind of camping than what I’m used to but there are many RV campgrounds for those who don’t like to rough it with tents and firepits. I’ve never seen a campground with internet service in my entire life, so I guess that’s a major perk for going the RV route. An interesting thing about this trip for us … we were gone 16 nights. We did not use “has WiFi” as our major criteria when choosing which RV parks to stay at (we use Trailer Life and look at the campground ratings). However, for the first time ever, every RV park we stayed at had WiFi. Well, if your definition of camping includes sleeping in a tent, then it’s not. My wife and I actually started with tent camping, then moved up to a conversion van (after which we never want to sleep on the ground again) and finally to the small class C motor home pictured (after which we never wanted to walk to a bath house again)! Yup this makes me feel like I need a vacation. Hopefully they’re safe and far away from the wildfires in Colorado! Thanks for the unique setup! Kinda funny actually. So if I put my MacBook Pro on my head will they put it on the website? No danger of the pixels melting there. It was well away from any wildfires and it was actually cool (we wore jackets in the morning and evening). Much better than the more than 100 degree temperatures we’ve been enduring since getting home! Sure you can set them up, but can you do anything with them with all that glare? 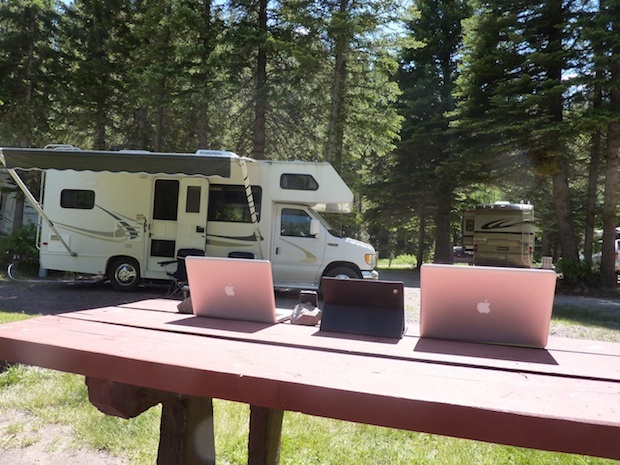 While an RV park isn’t my idea of camping, I must say that sure does look nice for an office! I’m not impressed by this at all. If you can’t ‘cut the cord’ long enough to go ‘camping’, why bother? We actually did “cut the cord” as much as possible. I would ask you to consider the fact that we were in northern New Mexico and southern Colorado. It would have been absolutely foolish of us to not keep track of what was going on with the wildfires. Personally, I would much rather get online and find the information I’m looking for in a matter of minutes as opposed to waiting for the local TV news to get around to covering the story. FWIW, the only time I had my MacBook Pro out on this whole (17 day, 16 night) trip was to take that picture. The rest of the time I used my iPad for brief checking of e-mail, news, and wildfires! I almost made it the whole trip on one charge. I always do take my laptop with me on vacation, however, because if there was a serious problem at work I might need to help out. Fortunately, that’s *very* rare. Some of us have jobs or family situations where we cannot completely cut the cord. I don’t see why that should prohibit us from camping or taking a vacation. Your responsibilities to your family or work shouldn’t prevent you from going on a trip, but every task mentioned here can be done with an iPhone. Besides, not long ago, millions of people took vacations with limited connection to the outside world, *yet somehow they survived*. Kirk (picturing Kevin and his wife facing each other at the kitchen table in their RV while surfing the ‘net on their laptops). Yes, everything mentioned could have been done on our iPhones. However, I’m not a young guy anymore and neither are my eyes. Therefore, checking e-mail and checking where the wildfires were was a whole lot easier on my iPad than on my iPhone. My iPad is WiFi only, so both my wife and I did use our iPhones when we needed to check on something (example: we were crossing Oklahoma and severe storms started firing) and WiFi was not available. As I mentioned in my previous reply, the only time I actually had my laptop out was for taking the pictures. I never leave home without it, because if there were an emergency at work a lot of the stuff I do is just a ton easier on a laptop than even the iPad. And I’d ask you to consider this … with gas north of $3 a gallon and my motor home getting a whopping 10 MPG, I’d much rather take the time to get online and discover, for example, that if I were to drive 250 miles north I’d encounter a new wildfire than to drive 240 miles and say, “Where’s all that smoke coming from?” – then turn around and drive 240 miles south. That wasn’t a matter of survival, it was a matter of making smart decisions. I personally take my iPad and whatever phone I have at the moment with me everywhere. Even if I’m camping. I don’t have the RV, but man the wife would love to have one. The reason I pack my iPad is so I can drop my pictures on to it with the camera kit. My boy on the other hand calls camping packing everything in on your back and packing it all back out on your back. I just drive the Jeep up and call it done because the older I get the lazier I get. Wow, calm down people. Stop taking it so personally. If this gentleman and his wife want to bring their gadgets along with him, that’s their prerogative. Camping and RV’ing are not always about “roughing it”. Personally, I LOVE being in nature, however, I’m still a city-boy and I need to stay connected to the world.